I can’t help wondering how diet, oral hygiene, and the presence or absence of halitosis factor in here, but I don’t expect that exhaling into the faces of old men is very beneficial for the young women in question. In fact it might be detrimental. Longevity studies have shown that lifelong bachelors (without, one supposes, easy access to the breath of young women) are more likely to die young. However, women living alone (who don’t, one assumes, regularly share their breath with men) tend to live longer than married women. Clinical trials may be in order. Lives of Saints, a miscellany of hagiographical curiosities published by John J. Crawley and Co., New York (1954), with the imprimatur of Cardinal Spellman. 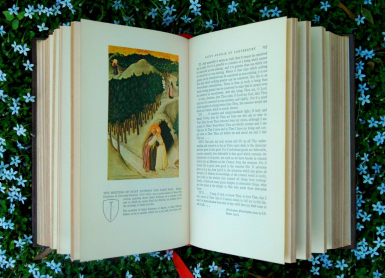 Considered as an object, it’s an especially appealing book, with patterned burgundy leatherette binding, a nice choice of typeface and color illustrations throughout. 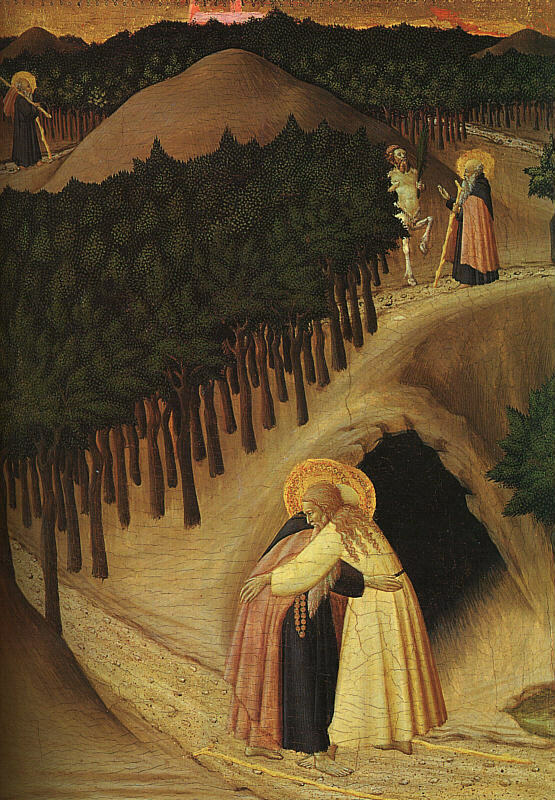 In the image above we see Stefano di Giovanni Sassetta’s The Meeting of St Anthony and St Paul (~1440). Athanasius’s Life of Anthony was written about the year 360, not long after the death of its subject. A Latin translation was made by Evagrius, and it became one of the most influential books of the next half-millennium. In it, Anthony is depicted as the Christian ascetic prototype, and his lurid torments at the hands of demons have been profitably exploited by artists for centuries (e.g. Bosch, Grunewald, Van Leyden, Michelangelo, Tintoretto, Cezanne and Dali). 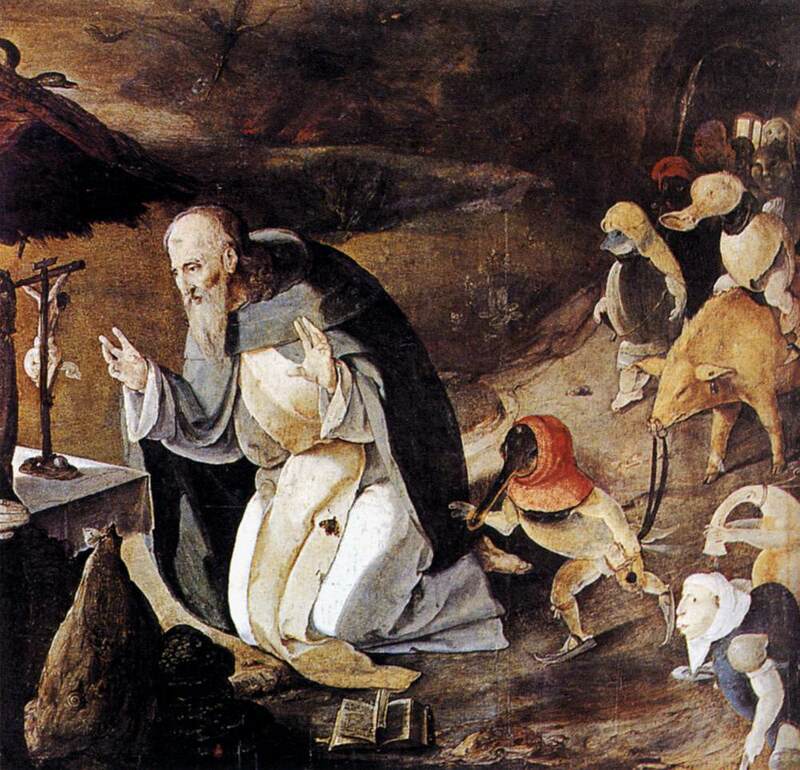 The event depicted in Sassetta’s painting, however, derives not from Athanasius’s biography but from Jerome’s brief Life of Paul the Hermit, written a few years later. Jerome’s book has as much to do with Anthony as with Paul, however, and thanks to Jerome’s digressions, Virgilian flourishes and love of trivia it’s even more entertaining. In fact, I can’t resist sharing some of it here. [He] was ordered to be taken off to a most delightful garden [and] made to lie down on a thick feather bed… He was laid there tied down by soft garlands to prevent him escaping. When everyone had gone away, a beautiful prostitute came up to him and began to stroke his neck with gentle caresses, and (what is improper even to relate) to touch his private parts with her hands: when his body was roused to lust as a result, this shameless conqueress lay down on top of him… He who had not yielded to tortures was being overcome by pleasure. At last, by divine inspiration, he bit off his tongue and spat it out in her face as she kissed him. It occurred to Antony (as he himself used to relate) that there was no monk in the wilderness more perfect than himself. But during the night when he was asleep it was revealed to him that there was someone else further into the desert interior who was far better than him and whom he ought to go and visit. Through trackless wastes Anthony marches for several days, seeing no one (find him in the distant upper left of Sassetta’s painting). Finally he’s surprised by a coarse-looking hippocentaur, half man and half horse. 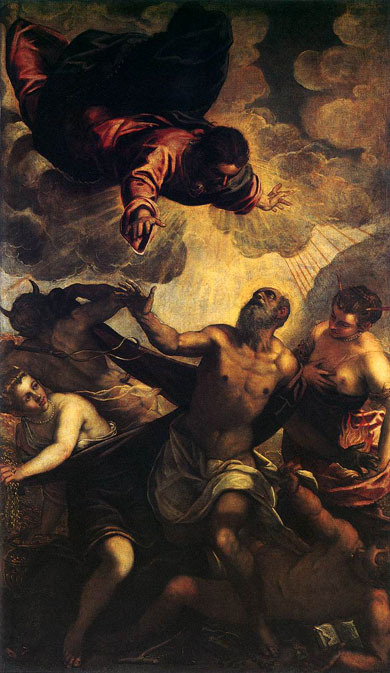 Frightened, Anthony asks where to find the servant of God shown to him in his dream. According to Jerome, “the creature gave some kind of barbaric grunt, grinding out the words through his bristling lips rather than pronouncing them” (see Sassetta’s upper right corner). Despite Anthony’s fears, the centaur proves harmless and points him in the right direction before charging off across the sand. In case anyone has scruples about believing this, it was proved to be true by what happened when Constantius was emperor, witnessed by the whole world. For a man of this kind was brought to Alexandria alive, providing the people with a marvelous spectacle. Later, when it was a lifeless corpse, salt was sprinkled on it to prevent the summer heat causing it to putrefy, and it was carried to Antioch for the emperor to see it. According to a footnote, the phrase preceding Paul’s words (“In response the hero spoke a few words thus”) is a direct quote from Book VI, line 672 (in Latin) of the Aeneid. After consulting it, I see that what Jerome has done here is to put Paul in the place of Musaeus, the poet-prophet-priest of ancient Attica, and disciple of Orpheus. Paul is to Christ, then, as Musaeus was to Orpheus, and he passes on to those who follow him (Anthony) the poetic-prophetic-priestly way of life contained in anchoritic asceticism. That seems to be Jerome’s message, and I can’t help but wonder if he isn’t trying to steal some of Athanasius’s authorial thunder (and fame) by suggesting that Athanasius’s hero, Anthony, only derives the perfection of his holiness through transmission from Jerome’s own hero, Paul the Hermit. When the dweller by the Nile saw the first Bedouin on horseback, or when Pizarro on his steed dawned dreadfully on the Mexicans in the New World, the legend of the centaur came into being. Of cavalry, we still use the word “horsemen”: and what is a horse-man but a centaur? Reading this, I thought at first that White had got his Aztecs and Incas mixed up, or else his Pizzaros and Corteses. I find, however, that Cortes’s full name was, in fact, Hernán Cortés de Monroy y Pizarro, so perhaps it was intentional. At any rate, I do like “dawned dreadfully,” and the explanation for the origin of centaurs sounds plausible. It doesn’t explain satyrs, of course, but if the ancient world regularly treated them the way Jerome says the Alexandrians did, it’s no wonder they avoid us nowadays.